Every great host has at least a few fancy coffee recipes in his or her repertoire. I like to set up a coffee bar at my theme parties and then let my guests mix the kind of coffee drinks they prefer. I usually have 3 airpots; one filled with strong regular coffee, one with decaf and the 3rd filled with hot water. Then I set out the basics including some great mugs, spoons, flavored creams and sugar. I also include a few different flavors of tea, hot chocolate mix, Baileys and Kahlua. Turkish - Place 1 tablespoon honey or sugar and 1 crushed cardamom seed in each serving cup. Fill cup with strong hot coffee and stir. Top with whipped cream. Viennese - Fill each serving cup with strong hot coffee. Stir in 1 teaspoon sugar. Top with whipped cream and sprinkle with nutmeg. Arabian - Place 1 crushed cardamom seed in each serving cup. Fill cup with strong hot coffee. Stir with cinnamon stick. 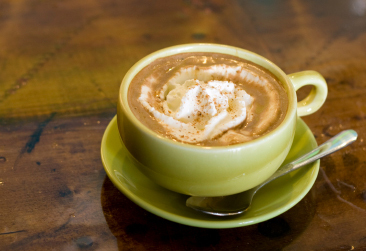 French - To prepare cafe au lait, you will need equal parts of strong hot coffee and hot milk or cream. Pour both at the same time into each serving cup. Swedish - For each serving add to the mug 1/4 teaspoon each of brown sugar, cinnamon, ground cloves and nutmeg. Add a strip of orange peel and fill the cup with strong hot coffee. Top with whipped cream. Mexican - Place 2 teaspoons chocolate syrup and 1/8 teaspoon cinnamon in each serving cup. Fill with strong hot coffee and stir well. Top with whipped cream and sprinkle with cinnamon and nutmeg. Brazilian - Place 2 tablespoons instant cocoa mix in each serving cup. Fill with strong hot coffee and stir with cinnamon stick. Top with whipped cream. Any one of these fancy coffee recipes would be much appreciated by guests especially when served with desserts like our Chocolate Amaretto Cake. You can find more of our favorite dessert recipes and warm drink recipes here. Another way to fancy up regular coffee is to serve it with a favorite liqueur like Kahlua, Frangelico, Amaretto or Baileys Irish Cream. 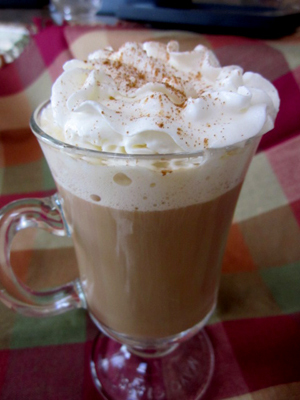 Just add a shot and top with whipped cream for an instant after dinner coffee drink. Like Baileys? Find several Baileys cocktail recipes here. I rarely drink coffee myself because me and caffeine don't get along, but every single morning I drink at least one Chai Tea made from a mix that I buy on line at Sams Club. Recently I ran across this video from divascancook which shows a very easy way to make Chai Tea at home without any fancy coffee equipment. Just a pan and some basic ingredients.